Explore the scenic backroads of the Texas Hill Country and learn about Texas cowboys and the Great Texas Cattle Drives. Visit the Lyndon B. Johnson State Park & Historic Site and take a guided tour of the "Texas White House"** with a National Park Service tour guide. Pass by award-winning wineries & orchards, before visiting Fredericksburg, a historic & picturesque German town. You will have time on your own to shop (optional), have lunch at an authentic German restaurant & biergarten (optional), or visit one of the many wine tasting rooms (optional). The time in Fredericksburg is on your own, so you can spend this part of the tour as you please. Finally, experience the magic & music that is Luckenbach, Texas. 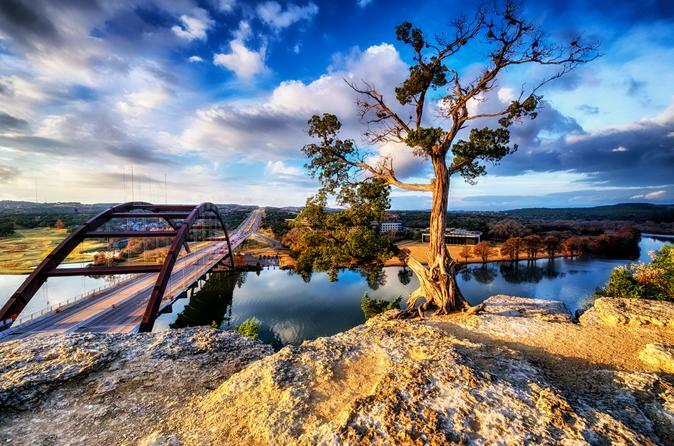 Travel along the beautiful, scenic backroads of the Texas Hill Country, with a brief stop in Johnson City at the National Park Services’ Visitor Center and Boyhood Home of President LBJ. Only a short distance away is the town of Stonewall, the peach capital of Texas and home to the Lyndon B. Johnson State Park and Historic Site. Enjoy a tour of the LBJ Ranch, located along the picturesque Pedernales River. We will stop for a break in Johnson City at the National Park Services’ Visitor Center and Boyhood Home of President LBJ. After our brief stop in Johnson City, we will head west to tour the beautiful LBJ Ranch and Texas White House on the Pedernales River. After the LBJ Ranch, we will head further west and visit the old German town of Fredericksburg, where you will have 1 to 2 hours of time on your own. If you prefer, you can shop and eat lunch at an authentic German biergarten. You can visit the Nimitz Museum & National Museum of the Pacific War. This Fredericksburg part of the tour is flexible, so you can do whatever pleases you! From Fredericksburg we will drive past vineyards on our way to legendary Luckenbach, Texas—where "everybody’s somebody." We will stop and take in the storied musical history of the colorful town of Luckenbach, made world-famous by Willie Nelson, Waylon Jennings, Jerry Jeff Walker, Gary P Nunn, Hondo Crouch, and many more artists and colorful characters. **Important Note: Starting August 3, 2018 and until further notice, guided tours of the interior of the “Texas Whitehouse” are cancelled per the National Park Service due to needed repairs. However, guests can still explore the LBJ Ranch grounds, view exhibition pieces and artifacts in the JetStar Hangar, watch an award-winning 14-minute film, and get a picture with LBJ’s infamous JetStar aka “Air Force One-Half”.